Two things were clear at last night’s community meeting regarding the stormwater and road project planned for Miami Beach’s La Gorce and Lakeview neighborhoods: The City has gotten better at communicating its plans and the neighborhood is divided on whether or not they want the streets raised to deal with flooding from sea level rise. 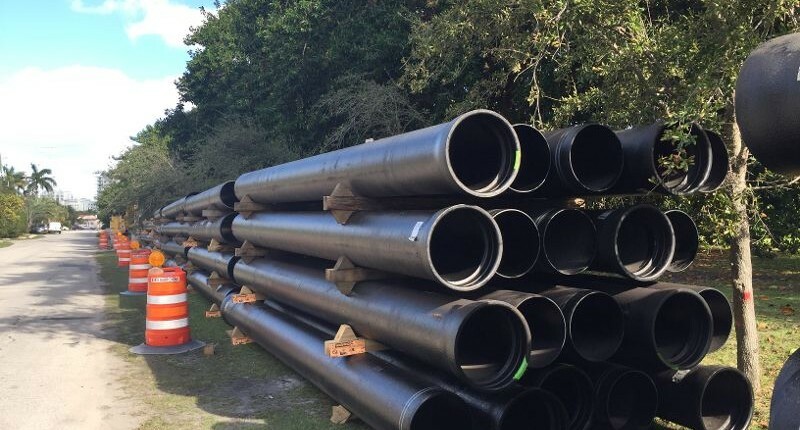 Nearly 100 people packed a room at the Miami Beach Golf Club to hear further details of the utility work and road construction that is slated to begin at the end of this year. The tone was set by Roy Coley, Miami Beach Infrastructure Division Director, who first talked the crowd through the challenges of an aging system and meeting new regulations. Rather than presenting the City’s plans, Coley repeatedly started sentences with “What we recommend for your consideration…” He emphasized the $100 million project will not only meet new regulations and accomplish the City’s goals for updating the 80-year old water and sewage system, it will also bring benefits to residents in terms of better water pressure and the ability to make repairs faster and with less intrusion on private property. Currently, water meters and access points for regular cleaning and maintenance of lines are in the backs of many houses, adjacent to hedges, pools, and even under fences making them difficult, if not impossible, to reach. At the same time, emergency crews may need to traipse through yards late at night, surprising homeowners. During the replacement of water and sewer lines in the neighborhoods, the City will pay to relocate homeowners’ lines from the backs of their houses to the front. (Should a homeowner not wish to participate now, they will be responsible for those costs later on.) Once that work is completed, Coley said, “You won’t even know we’re there” when the City comes out for cleaning or repairs. City Engineer Bruce Mowry, a fixture at the community meetings explaining the projects neighborhood by neighborhood, showed photos of flooding that occurs now on sections of North Bay Road and the West side of Lakeview near Alton as well as aerial LiDAR surveys highlighting elevations lower than the Bay on many streets. He also showed before and after photos of homes on streets that had been raised, using them to illustrate how “harmonization” works to blend the new street elevation with yards and driveways. As he has at all of the meetings, Mowry emphasized he is available for individual meetings to walk through the unique situations that each homeowner will face. The City did a better job at this meeting of describing how water will drain from the elevated roadway into storm drains and not onto yards that will sit below the new streets. In addition to inlet drains at the edge of the pavement, there will also be a lower inlet drain system adjacent to the property line to handle water. A program is being finalized that, if approved by the Commission, would allow homeowners to push water from their properties into the City’s storm drain through the inlets, including water that flows from roofs and downspouts. The Commission is expected to discuss the program at its April 26th meeting. At this point in the meeting the crowd began to disagree, alternately shouting out support for raising roads now and for a delay. Those in favor gave examples of flooding on their streets and water intruding on their homes with one man relating how his garage at 59th and Alton has flooded three times causing the loss of a car. Those against said they’d lived in their homes for decades without any flooding. Mowry said the projects were prioritized by worst neighborhoods first and that if residents wanted to take a pass on raising their roads, there are others in line that want to be moved up. He used Sunset Harbour as an example where the City had only planned to raise 20th Street and Purdy Avenue but the community started a petition that garnered 1,000 signatures to raise all of the streets. 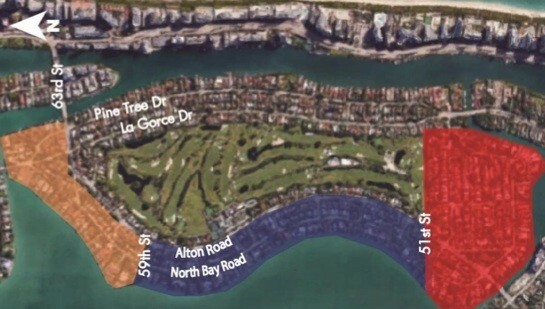 Carpenter, who has been frustrated by criticism of a flood in Sunset Harbour last fall, said the City experienced a “triple whammy” of events: a pump that had been “plugged” due to construction because of the potential of turbidity, a king tide that was among the highest in the last 20 years, and a heavy rainfall. “It happened to be a series of unfortunate events,” he said. While being willing to give residents a greater say in what happens to their roads, the Commission emphasized the need for them to have all of the facts about the elevation of their properties, the specifics of how high the road directly in front of their houses will go, and the consequences of not raising their roads. Carpenter echoed that last night, “There’s been a lot of misinformation.” He urged the audience to “get the facts” before making decisions. One man complimented Mowry and his team on his individual meeting and urged neighbors to have one-on-one meetings to understand what the project means for them specifically. “You would do very well to meet with him,” he stated. Heather Leslie, the construction public information liaison, is working through the large number of meeting requests but said they are catching up on the backlog. As of now, it takes about a month from first contact to a meeting being scheduled. Contact her via email or at 305-905-5876. The City is continuing its education effort on the neighborhood improvement projects next week with an Open House, co-hosted with the Bayshore Neighborhood Association, to give residents an opportunity to learn more about sea level rise scenarios, elevation terms, the engineering behind the projects, and flood insurance. The Commission is also planning an educational workshop in the near future.